Music festivals have created unique offspring that take the same aesthetics, roots, and philosophies and turn them into something truly one-of-a-kind. Further Future in Las Vegas is a new kind of gathering that offers a music and art based event with a twist on the transformational music festival scene. Founder Robert Scott and his team have created a space for like-minded individuals to create, express and share. A diverse lineup is not all this event has to offer. With the usual array of festival accouterments such as yoga, workshops, and healthy living, Further Future also offers full spa services, a pop-up luxury village, hair styling, gourmet culinary programming from award winning Las Vegas chefs, mixology programming from Francis Harris, and even a pop up dinner with wine pairing on a cliff top at sunset by celebrity chef Sam Marvin. With more to come, Further Future is creating a place unlike anywhere else in the world. Morena: You began with a career in law and finance, what inspired you to transition into the music festival world? Robert: I have always been very involved with the music and events industry, and my legal practice encompassed a great deal of entertainment and artist related work. This led to opportunities to work with many of the Further Future team, including our creative director Jason Swamy and other amazing people like George and Gary Mueller, Michael Calabrese, Benjamin Alexander and Walter Smith. Swamy and I have been working together on various projects for nearly 15 years and our contributions to Further Future is in many ways the culmination of much of that work. Morena: Music festivals come in many different varieties, sizes and philosophies. What are some of your favorite music festivals that you have attended? Robert: As a group we really strive to spend our energies exploring the tip of the spear when it comes to festivals. You are more likely to spot us at Wonderfruit in Thailand than Coachella. What the mega-festivals like Coachella and EDC continue to produce is pretty staggering and very impressive, but personally I am most excited by what is on the fringes. 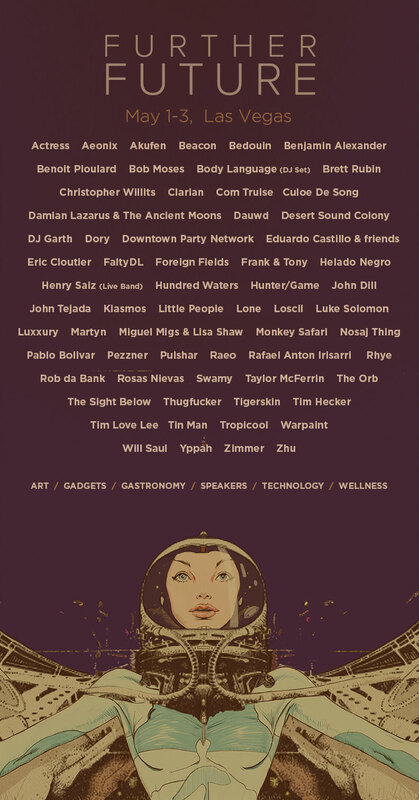 I do of course love and revere Burning Man, although it is hardly a "music" festival and other favorite events are Sonar in Barcelona and ADE in Amsterdam. Morena: How do you incorporate your background in law with Further Future gathering? Robert: It can be very useful to have a background in legal structuring, risk management and running complex transactions when working on an event as complex as Further Future. Morena: Tell me about the inception of Further Future. Who's the core team? How did it come about and what inspired the name? Robert: We have quite a few ideas for what we will do next with Further Future, although it's not our intention to ever build this into an enormous event. We definitely value the intimacy and community that comes from a smaller event comprised of people who are truly invested in what we are all trying to do.